This new release of Converseen brings important improvements on picture previews. In fact, a long date problem due to Magick++ API and Qt4 has been finally solved. Since the first version of the program, Converseen hasn’t been able to show correcly previews for some formats managed directly by Magick++ API (e.g psd, xcf) showing them with glitches, artifacts and wrong colors. Today I’ve finally managed to rewrite the 80% of the algorithm solving the problem and improving it’s computing speed so the previews are almost instactly loaded. 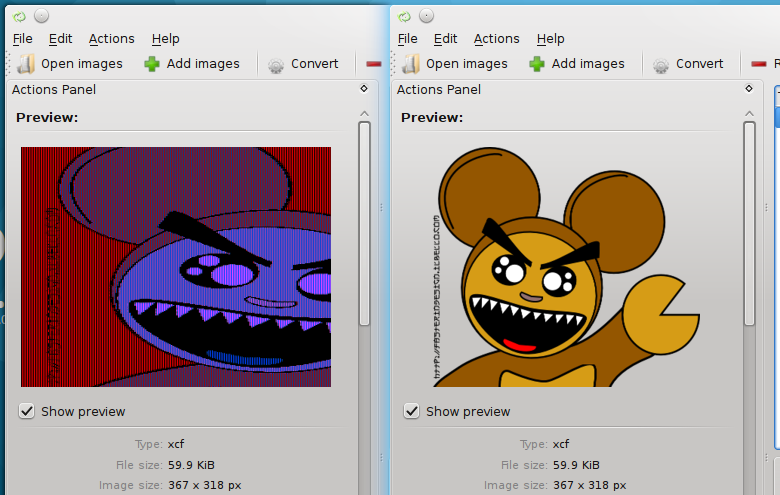 As you can seen, the xcf preview is correctly loaded and proportioned.